Australia’s Indigenous population — mainland Aborigines and Torres Strait Islanders—was counted at 670,000 (3 percent of the total population) in 2011. Historically most Aboriginal groups were nomadic hunters and gatherers with no permanent place of residence. They had a strong dependence on the land and also the water. The Aboriginal groups are believed to be among the earliest human migrations out of Africa. Despite most likely migrating to Australia through Southeast Asia, they do not appear to be demonstrably related to any known Asian or Polynesian populations. However evidence shows that there was genetic and linguistic interchange between Aboriginal Australians and the Austronesian peoples of modern-day New Guinea. The term Northern Australia is generally known to include two states and territories, Queensland and the Northern Territory. Indigenous Australian people make up 30% of the Northern Territory’s population. Aboriginal – Northern Australia represents 5,378 individuals, self-identified as Aboriginal, who were sampled in 2005 the University of Technology in Sydney, Australia. Aboriginal – Northern Australia represents 586 individuals, known as pure Aboriginal, who were sampled in 2005 the University of Technology in Sydney, Australia. 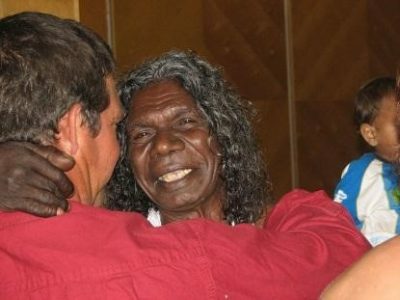 Photo: David Gulpilil, the star of Walkabout, was born in the Northern Territory. Photo by Stephen Michael Barnett, Wikimedia Commons. Source publication: Population data from sub-populations of the Northern Territory of Australia for 15 autosomal short tandem repeat (STR) loci, FSI, 2007, p237-249.